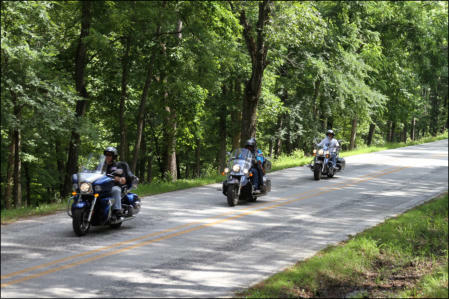 I’ve traveled by motorcycle to more than 30 states, and Arkansas ranks high on my list as one of the most motorcycle-friendly states I’ve visited. With more than 52 state parks, and sprawling mountain views, it’s no wonder it’s called “the Natural State.” Add in twisty backroads with rolling scenic landscape and plenty of elevation changes, and it was an easy decision when the leaders of the North and South Central regions of the Vulcan Bagger Association (VBA) went looking for a destination for a combined rally. Rally organizers Dave and Crystal Jesse took the lead, due mostly to their proximity to the area, and did a lot of the legwork by planning guided and self-guided rides and many other activities for everyone to enjoy. 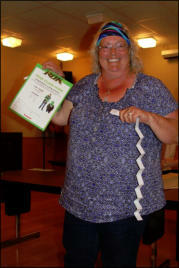 Of course, several other members helped by bringing BBQ grills, shopping for food, organizing the raffle, leading group rides, and so forth. 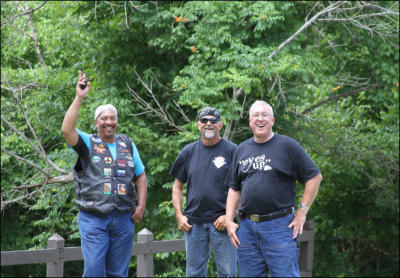 The Ozark Folk Center State Park in Mountain View, Ark., served as rally central for the 2014 Vulcans in the Ozarks Rally. 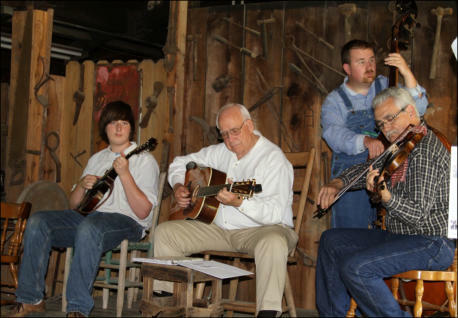 The Ozark Folk Center is best-known for its annual Folk Festivals, and is devoted to the preservation of Southern mountain crafts and folk music. 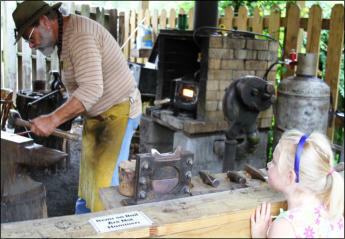 Many rally goers enjoyed the opportunity to explore the craft park, which offers demonstrations by a blacksmith, and goods made by woodcarvers, quilters, broom makers, potters, stained glass makers and numerous other crafts. Concerts also featured songs and instruments from America’s past. The rally kicked off with a Meet and Greet on Monday providing everyone a chance to reconnect and make introductions over a meal of BBQ pork, baked beans, coleslaw and refreshments. Ross Chess brought his 11-year-old grandson, Eli, to the rally while they were on a summer road trip that included a visit to Branson, Mo. No doubt, Eli had plenty to talk to his friends about when he returned home. John Dyer, who is active in both the Vulcan Bagger Association and the Vulcan Riders Association, traveled all the way from Arizona to attend the rally. 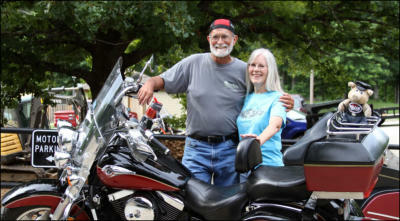 He was on a quest to ride through as many states visiting friends as his summer vacation would allow. With many of the same events on our schedules, I looked forward to seeing him at the next one. Most mornings started off with breakfast at the onsite restaurant called The Skillet, where riders shared which routes they planned to take over a delicious breakfast and endless cups of caffeine for those who needed a jolt to get their day started. With bellies full of homemade oatmeal, bacon and eggs, it was time to get geared up for the day’s ride. Despite rain in the forecast, the weather cooperated almost every day of the rally. Tuesday’s 225-mile guided ride to Peel Ferry and into Missouri was no exception. As many as 30 bikes lined up under partly cloudy skies as we departed on our ride. While en route to Peel Ferry, the group headed northwest on AR 14 through the Ozark National Forest with a quick stop at the Buffalo Point Recreation Center for photos. 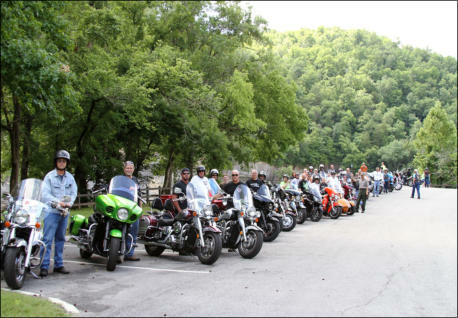 While at the Buffalo River overlook, a park ranger making rounds stopped to admire the motorcycles and told us that he owned a Kawasaki KLR™650 motorcycle. Continuing on, we rode through Yellville to AR 125 to reach Bull Shoals Lake. 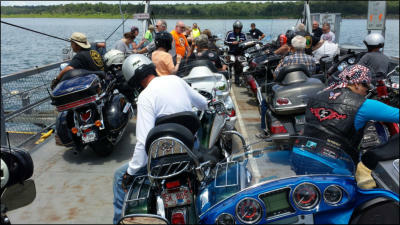 When the road ended, we staged the bikes and waited to board the ferry which is operated by the Arkansas Highway and Transportation Department. 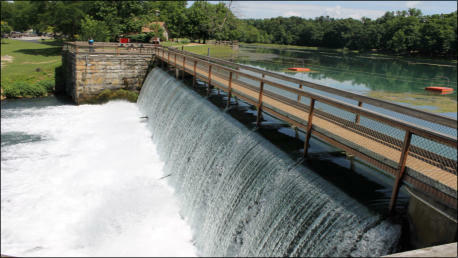 It transports vehicles across the lake into Missouri and back at no charge. If you’ve never crossed a lake via ferry while on a motorcycle, it is really a unique experience. Once across, we continued on into Missouri for a well timed lunch stop at Cookie’s Restaurant. After lunch, the group headed back via Highway 5 and returned to the cabins, while some veered off on AR 341 for a more advanced stretch of curvy tarmac leading back to Mountain View. 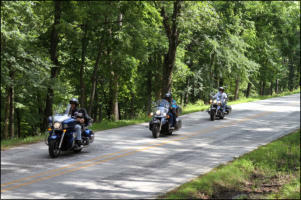 Riders enjoyed plenty of curvy roads and long sweepers through the Arkansas and Missouri countryside. Wednesday was a free day providing rally goers an opportunity to spend the day however they chose. 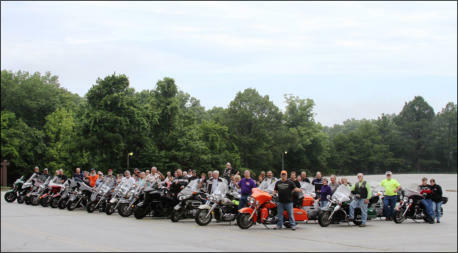 Several riders formed a small group and rode out to another popular destination called Mammoth Springs. While some riders chose a more leisurely day to explore the shops at downtown Mountain View. I took advantage of the opportunity to do some sightseeing at the Ozark Folk Center. The staff at the Ozark Folk Center really went above and beyond for our group, even making their auditorium available one evening for a special screening of the movie Why We Ride. By the time the screening was over, we had worked up an appetite for a late dinner and exchanged our own stories about how we got started riding motorcycles. Jim Hardin and his wife, Bea, helped organize the raffle so rally goers could put their tickets towards items they wanted a chance to win. 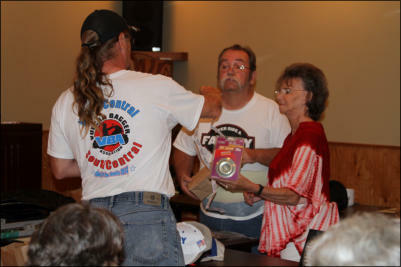 Jim doubled as emcee and kept the group entertained while calling winners of the door prizes provided by Riders of Kawasaki (ROK™), Butler Maps, JC Motors, and others, including the rally goers themselves. 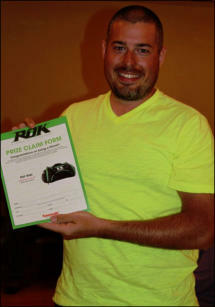 Several attendees who won cash prizes made a donation to VBA member Scott Carriker and his family, to assist with expenses related to a work accident. The group enjoyed a special finale dinner at The Skillet restaurant that included some home-style cooking of fried catfish and all the fixin’s. After our meal, rally co-host Ray Slansky presented Dave and Crystal Jesse with a special plaque to thank them for their efforts in planning the event. And, to wrap up the rally, VBA Vice President, Jay Stephens who attended the rally with his father and young nephew, thanked everyone for coming and making it an enjoyable event. The following day everyone loaded up their bikes and while some prepared for a return trip home, others continued on with their travels. 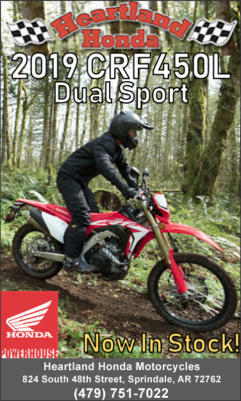 It was a great event which provided plenty of great riding with an enthusiastic group of Kawasaki owners and an opportunity to make new friends. To learn more about the VBA, visit vulcanbagger.org. For those not familiar with the area, Mountain View is nestled in the southern part of the Ozarks and is roughly 125 miles from the popular tourist town of Eureka Springs.